In the last five months or so, I've started listening to audiobooks. I download them on my phone and listen to them as I drive, cook, clean, exercise, or clean up the garden. Working at home alone, most of my day is spent in silence or listening to music, so I find the patter of an audiobook a welcome diversion from the weird voices in my head telling me to shove my thumbs in the brie or put shoes on the dog. In print, I read everything and anything, but my preferred type of audiobook is nonfiction, usually on the topics of writing, creativity, and/or entrepreneurship. 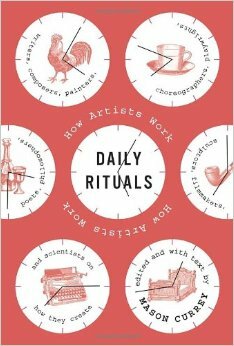 Right now, I am enamored of my latest choice, Daily Rituals: How Artists Work by Mason Currey. Currey started the Daily Routines blog in 2007 and published a book following an article on Slate that profiled his work. I first heard about Daily Rituals on the Tim Ferriss podcast. Here's the book in a nutshell. [Daily Rituals] presents the routines and working habits of 161 creative minds—among them, novelists, poets, playwrights, composers, painters, philosophers, and scientists. It is packed with anecdotes about getting up super early, staying up super late, drinking heroic amounts of coffee, taking precisely timed naps and long daily walks, and much more. This book is fascinating. Fellini, Mozart, Hemingway, Woody Allen, Sylvia Plath—the list is long and eclectic. Halfway through, I've learned these routines are as varied as the people who lived by them. Some people woke up early. Some people slept in. Some drank. Some were teetotal. Some relied heavily on barbiturates and amphetamines. Some swore by long walks. Certain details from the book stick in my head. Patricia Highsmith's obsession with snails. Louis Armstrong's nightly routine of a laxative and a joint. Gertude Stein's penchant for gazing at cows as she wrote. As a teacher, my life was ruled by the clock for thirteen years. As a writer who now works from home, I don't have a daily schedule so much as a few rituals I try to complete every day. The theory, I believe, is to get one's daily tasks done in such an automatic way that the rest of the brain is free to handle problem-solving and creative projects. I really like this idea, but I've found in my life, some things stick and some things don't. That's the breaks, I guess. 1. Make the bed every day. 2. Social media posts every morning. 1. Answer emails in a batch at 8 and 5. 2. 1000 new words every day, not including editing. 3. Water and tea only. No more soda. Adult beverages only on festive occasions. 4. Hand write a short to-do list every morning before I fire up the computer. It's exciting to think that small adjustments to our daily rituals can affect larger changes, like better health or higher productivity. I'm not sure what the next 365 days will bring, but I know I'll do what I can to spend them well.